My Hero Academia Vol. 14 Review – AiPT! There’s a new bad guy in town–and boy does he impress. The series has never felt stale, but things are heating up even more than usual in My Hero Academia. The shonen superhero series by Kohei Horikoshi just released its fourteenth volume, collecting chapters 119-128. This installment features the latter half of Midoriya’s fight with Bakugo, a meeting between Overhaul and the League of Villains, and the first appearances of Mirio Togata and Sir Nighteye. There’s definitely a lot going on in this volume, but is it good? The portion of this volume devoted to Midoriya’s brawl against Bakugo is relatively brief, but it’s easily one of the most important scenes. Bakugo has been getting a lot of in-depth character analysis in the last few volumes, and it all culminates here. His admiration of All Might has colored his actions as an aspiring hero, as well as his interactions with Midoriya. The dynamics between the three characters shift significantly in this volume, but it’s in a way that feels true to their individual motivations and that promises more great character work to come. It must also be noted that Horikoshi’s artwork in this scene is fantastic. Watching Midoriya and Bakugo go at it is a lot of fun thanks to uber emotive facial expressions and stellar flow of movement across panels. 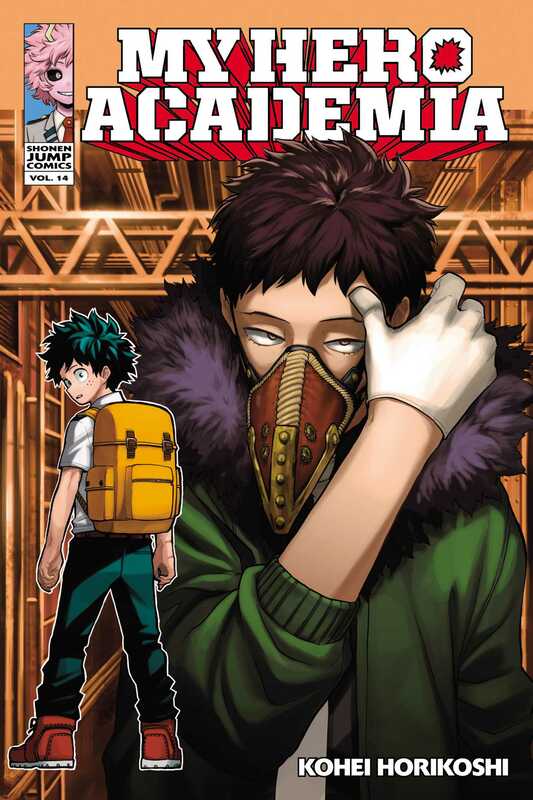 This installment also features the first seeds of the Overhaul arc, although much about the character remains a mystery. One thing is certain, though–his design is awesome. The plague doctor beak he wears is over-the-top and strays wildly from what one would expect a yakuza boss to look like. Overhaul encounters the League of Villains roughly halfway through this volume, and like Stain before him, he doesn’t play nice with the top antagonists in town. The conflict between these two factions is sure to be intense, and Overhaul’s mob roots add an interesting layer to the drama. In a series riddled with showdowns between superheroes and supervillains, I never expected to see gangsters rise up as a force to be reckoned with. Also of note in this volume is the introduction of Mirio Togata. Togata teaches Class 1-A about work studies and shows off his fighting prowess in the process. His Quirk, permeation, is nuanced, but it often manifests as phasing ala Kitty Pryde. Horikoshi uses Togata’s abilities to great comedic effect, like when Togata phases just his face through the ground beneath Midoriya. Naturally, this gives our hero quite a shock. The comedy is further enhanced by Togata’s baby-faced design. This volume also introduces Togata and Midoriya’s mentor in their work studies, Sir Nighteye. Nighteye has quite the odd demeanor, as he seems deadly serious but also stresses the value of humor. Nighteye is All Might’s former sidekick, and he has passionate opinions about All Might’s choice of Midoriya as a successor. The tension between all these characters, and the fact that they will be working together closely in upcoming volumes, is a perfect recipe for conflict. There’s virtually nothing wrong with this volume. My only gripe is that I wish Overhaul got a bit more development or page-time that wasn’t shared with the League of Villains. The tense meeting of the two evil forces would be even more striking if we had a clearer idea who Overhaul is or what he stands for. With that said, I’m being very nitpicky here, and all the characters involved still come off as being cool and intimidating. Overall, My Hero Academia Vol. 14 is one of series’s best volumes to date. Horikoshi introduces numerous new characters and firmly establishes why they are important to Midoriya’s quest to become the number one hero. Old characters, most notably Bakugo, also receive great development. The artwork throughout is crisp and exciting, and there are very few complaints to be had. This series continues to be the best superhero comic currently on stands. Great action, character debuts, and shifts in dynamics make this volume one not to be missed.